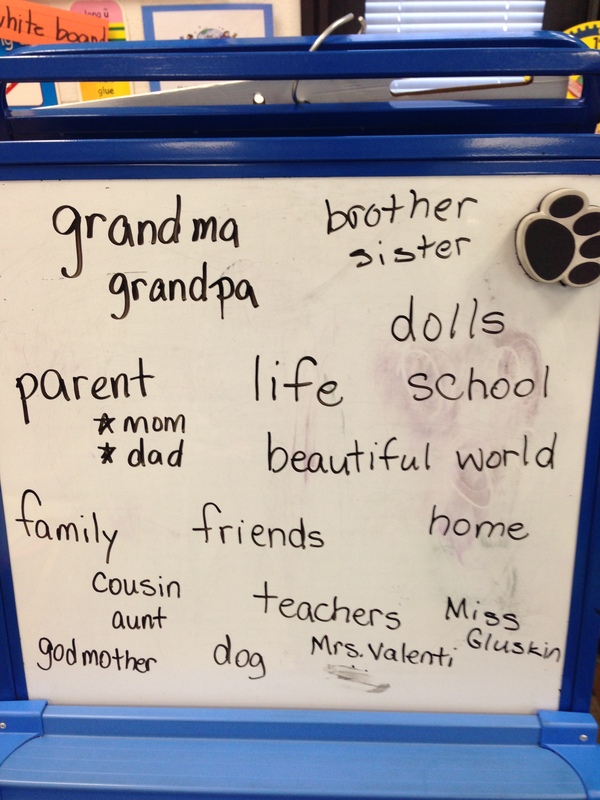 Last week at our first grade team meeting, we decided we wanted to do a writing activity for the students to write what they are thankful for. We wanted to do something different than the standard turkey and writing in his feathers. We thought of other Thanksgiving symbols and decided to use fruit in a cornucopia. The teachers looked through books and templates they had, and I was ready to search for ideas on the computer. It was a complete group effort to create and design this project. We took the students throughout the entire writing process. 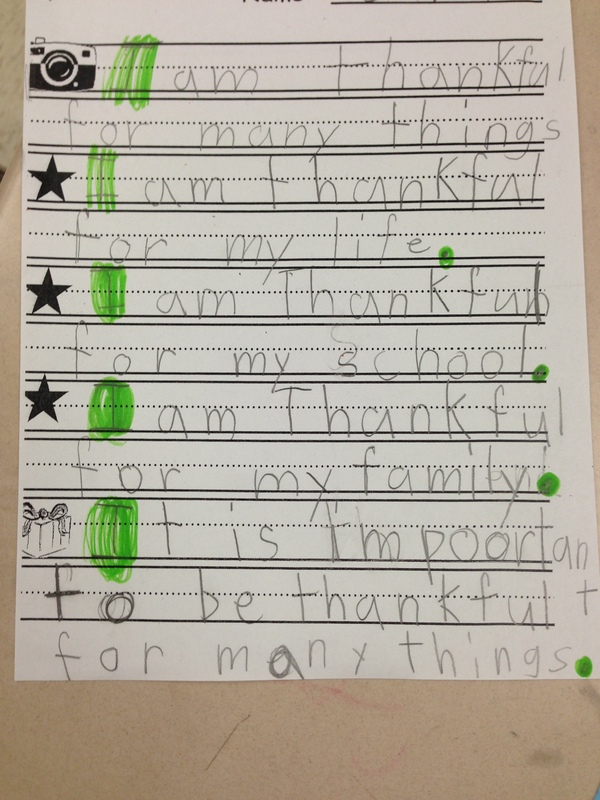 First we discussed what it means to be thankful and brainstormed a list of ideas; we emphasized being thankful for nonmaterial things. Then, the students wrote a rough draft that was scaffolded since it’s still the beginning of the year and we’re working on writing complete sentences and ideas. After their piece was edited, the students rewrote each sentence on a piece of fruit. 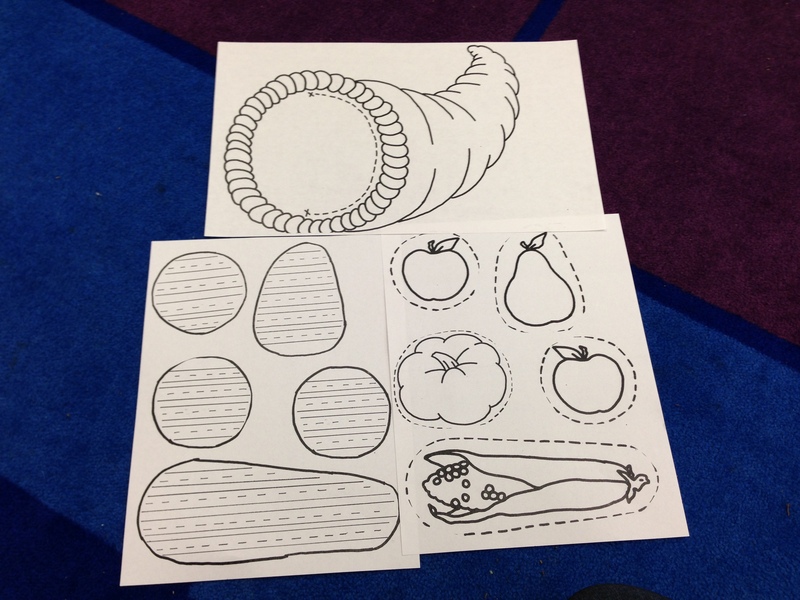 The students then colored and cut out the fruit and cornucopias. They received help attached the fruit to the writing to make it flip up, and then they finished assembling their work. These projects turned out very well and it was a nice change of pace from the regular curriculum. There were a lot of steps and the cornucopias took a long time to create, but the students were engaged, thoughtful, and hard workers. Sometimes everyone needs a break and to do something different and fun. 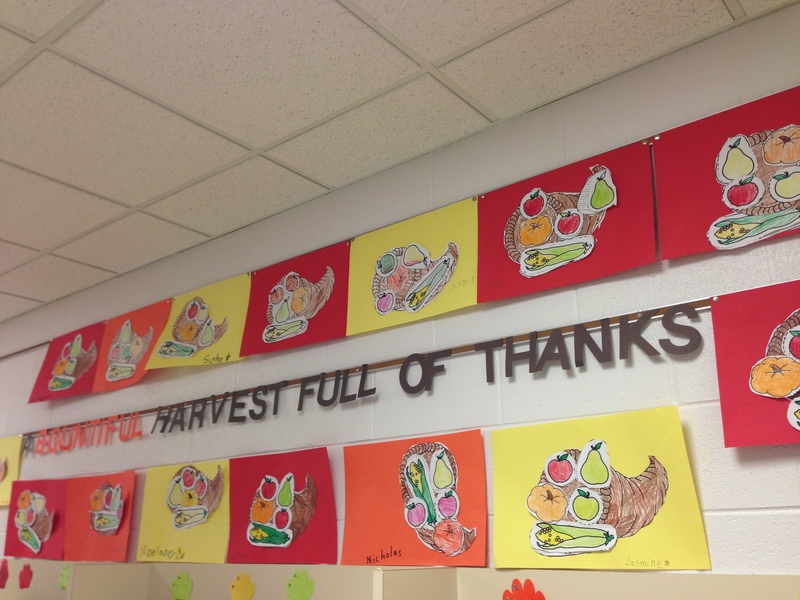 Giving thanks is an important skill to have, and this project was a meaningful way for students to apply and incorporate their knowledge and ideas into different subjects-writing, social studies, and art. This is an activity I would definitely repeat and is something that could be adapted for different grade levels. In first grade, we are in the middle of our science unit and balance and motion. Students have completed experiments to learn what are balance, stable position, and counterweights. Using the FOSS curriculum, each lesson builds on the previous one. Science is very hands-on, so students look forward to the experiments and having fun! Last Friday, we completed the pencil challenge experiment. 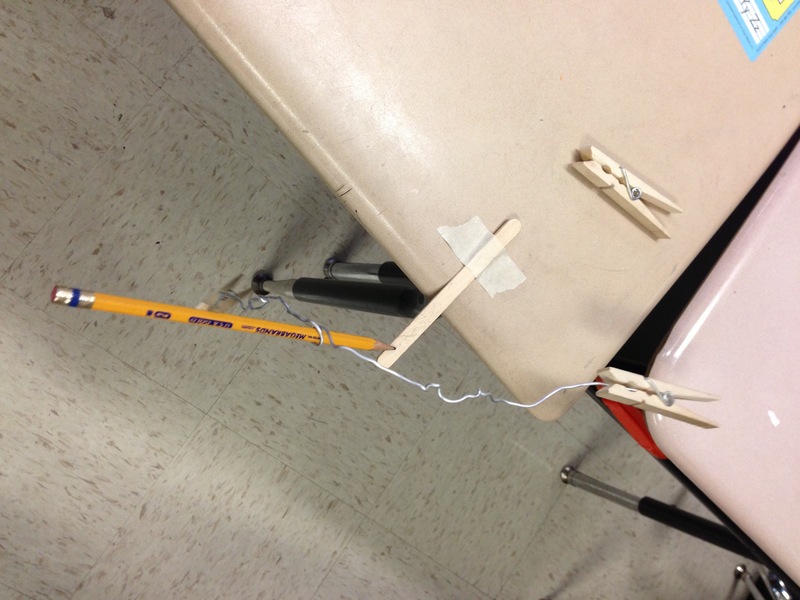 Students were given a pencil, wire, and 2 clothespins and told to find a way to get the pencil to balance on its tip. They were not given any further directions, just to think about what we had talked about and go experiment. Immediately, the students got to work. It was fun to step back and see what happened. Students put the clothespins on the pencil, wrapped the wire, and continuously tried to get the pencil to balance, while watching it fall to the floor. We encouraged the students to keep going and promised them it was possible. We tried giving them hints about what they’ve learned about where the counterweights should be in reference to the stable position. We also told specific students when they were on the right track or getting closer. It was interesting to watch when we told some students they were close, how others would look around and then try to mimic what that student started. Some students started working in partners. After some time, a couple 2nd graders who completed the experiment last year came to give some big hints. One first grader got really close, and I gave him some big hints. Finally, he was successful! Everyone was very excited and gave him a round of applause. Students now had a better idea what they needed to do and continued working. He became an expert and was told to help some of his classmates; everyone started shouting his name because they wanted their pencil to balance. While some students got discouraged or frustrated, no one gave up. In the end, with all the experts our class had, everyone successfully found a way to balance the pencil on its point. Afterwards, we reflected on the experiment-How did you get the pencil to balance? Why did that work? What were some other ways you tried? Where did the counterweights need to be and why? By actually doing the investigating, science became real to the students, and they understand it. And school was fun. Shouldn’t everything be like this? !